Cake has been called the 'staff of life', feeding body, mind and soul. There is a huge range of recipes for 'cake' from the ancient almost bread like cakes made with yeast, though simple, plain cakes to elaborate and rich cakes. Cakes are named and categorised by their ingredients such as seed cake or marmalade cake, or baking method, sponge cake, Pound Cake or even Boiling Water Cake, or for the celebration and tradition they are associated with, as in Christmas and Simnal Cake. Cakes may be small for individual consumption or large for sharing with an almost ceremonial division, but always for pleasure. Generally cake is the baked mixture of some or all of the following; a form of flour, sweetener such as sugar or honey, a binder in the form of eggs and/or fat, a raising agent like yeast, baking powder, and flavouring – spices, essence and dried fruit. Cake is taste, aroma, texture, colour and nutrition. There is chemistry and expertise in every concoction that is created in the kitchen. And there is a great wealth of knowledge and lore in cake making, in time-tested and reliable recipes that are traditional, regional and familial. Many people carry this knowledge almost in their DNA, cooking regularly, repeating, adjusting, and re-inventing. Food chemistry, what does what when combined and cooked plus the chemistry of love, both are needed to bake a good cake. This chemistry is not the food science of an industrial process but the homely magic chemistry of practical knowledge built on curiosity and understanding mixed with love and a cherished recipe, honed over the generations. This is what is needed to make a good cake and a happy cook. This is the science of deliciousness. Much of the British tradition of cake baking has its history in frugality, resourcefulness and requirement. A Northern European climate and a rurally-based population required food to nourish, warm and sustain. Many cakes’ ingredients belie restricted budgets and accessibility of ingredients such as the use of potatoes and oats and also tell us about cooking facilities. Many are griddle-cooked or 'Pot' cakes that can be cooked over a fire with coals placed on top of the pots lid. In "Cakes - Regional & Traditional" Julie Duff writes about Turf Cake from Yorkshire, which has no real recipe as such being made from the leftovers at the end of bake day, bread dough, pastry and cake mixture are mixed with any spare dried fruits and so on and moulded into cake form and cooked. Many recipes tell of their very history and reason for existence; Harvest Cake, Threshing Cake, Hopping Cakes and Shearing Cake. The farming calendar and the religious calendar were merged by the church to give ritual and restraint to a day's festivities; to curb over indulgence and un-tempered enthusiasm. 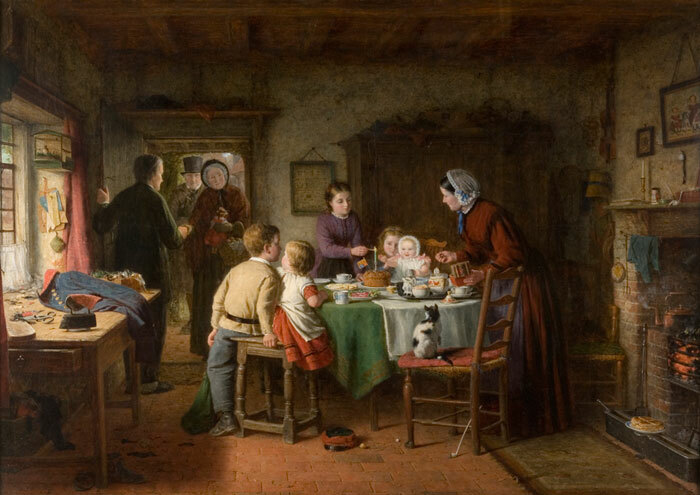 This with the need to provide food for the gathered workforce became a way of giving 'thanks' for the bounty and so ritualising social gathering and forming a link between dates, season, celebrations and cake. Country fairs, markets and gatherings of all natures have cakes specifically for them - Hiring Fair Cakes, Nottingham Goose Fair Cakes, Hogmanay, Hunt Cake. Wedding Cake, Christening Cake, Funeral and Wake Cakes, Soul Cake, Godparent Cakes and Birthday Cake mark life's moments and rituals. Changing seasons all have cakes too, Twelfth Night, First Footing, Apple Cake and Blossom Cakes. Cakes are named after counties as in Suffolk Cakes or Yorkshire Cake and by town and region, Belvoir Cake and Eccles Cakes. Others conjure up a place by their very mention, Parkin, Soda Cake, Singin’Hinnie, Lardy Cake. All cakes tell of the rich and varied culinary history of Britain. 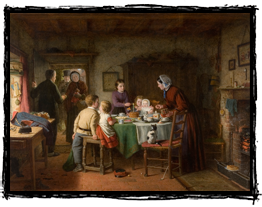 Imagine the British at their table; I'm talking of the stereotypical images from films, literature and paintings. The French have lunch in the country, a rustic setting, a long table dressed in a white linen table cloth shaded by vines and laden with wine, crusty bread, oozing cheese and a basket of ripe apricots. For the British we think either indoors, snug around the fire protected from the cold, there will be toasted crumpets, a fruit cake and strong tea on offer or alternatively we are outside, the summer picnic, scones and cream, the light and airy sponge cake and lashings of ginger ale. 'Tea and cake' has become our culinary trademark. It is almost the meal we take the most seriously, others can be overlooked, grabbed and wolfed but given a choice of stopping, making time and effort for a meal - "a nice cup of tea and a sit down" is always a welcome invite. It's almost the national mantra. It is imbued with meaning and significance for the British psyche; the solver to all life’s problems, a pick-me-up, something to keep you going and it returns us to 'Home'. Teatime means childhood, the cosy kitchen, and the back from school raid on the cake and biscuit tin. There is nostalgia in the word 'cake' it is sweet comfort food, and it means family; when the arms of the home embrace and shelter you from the outside world. Whatever the weather may throw at us the tea table will soothe it away. Nothing beats a cup of tea and a bit a cake after the long dog walk, the backbreaking chore in the garden, the DIY nightmare. Continental cake is altogether of a more delicate nature than its British counterpart. The delicate layer of sponge, sieved fruit puree, glossy sugar glazing and precisely placed decorative fondant or chocolate item shows a meticulous balance between the art of construction, the finesse of fine cookery and polite society. The British cake really is the brute of Europe, weighty with vine fruits, strong flavours and chunky in construction. With British cake the fist is of more use than the cake fork. It’s a question of substance versus aesthetics. British cake, like its people, is charming, quirky, idiosyncratic and sometimes even eccentric. You may ask - Why try some of these old recipes of cakes over my present favourite? Why think about the origins of cake? There is great pleasure to be had from trying and experiencing new and different things. Food is said to be the spice of life, it can be and should be more than fuel. Eating, something we do several times a day throughout our lives should be a pleasure. We should relax, make time and if possible share it with others. Is it a good thing to be able to eat what we want, whenever we want and to be so spoilt for choice? Or would we appreciate our favourite cake all the more if it was available only at a certain time of the year? We could look forward to it like Christmas or our birthday, a treat to be cherished, relished and desired rather than an inevitable everyday occurrence. It would be good to generate respect for the food we eat. Understanding, thinking, and appreciating what, when and why we are eating, alters our whole impression of the food and everything that has gone into making it. It takes time to make good food; we should take time to enjoy it when we eat it. Consider these - local economy, sustainability of town centres, in-town versus out-of-town shopping, community versus nationals or even global, air and freight miles. Support it or lose it. Your local shop is a place to meet and greet, for a gossip, a chinwag and a catch-up, for news, condolences, felicitations, congratulations, best wishes and for bemoaning life and weather, for passing the day, for a friendly face and a moment of human neighbourly contact and inter-generational interface. This project is not just about the buying of cakes. I hope that it will intrigue and encourage greater thought about what we put in our mouths and why. Also it will hopefully encourage us all to take more time over the food we eat and the community we live in. Maybe some of you will even bake cakes. What could be nicer than the satisfaction of a home-baked cake? Imagine that smell and the taste; it is pure pleasure on a plate. Cake really is the ultimate slow food, cooked with love and attention and eaten with relish. Not frenzied fast food but leisure, pleasure food.